​​Round Table was and is instructive and educational for youngsters. It was for me. So, I remembered President Kennedy’s words when he said “Roy, do not ask what 41 can do for you, but ask what you can do for 41”! 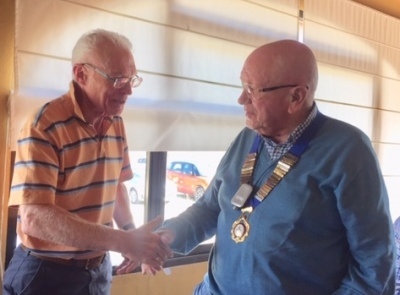 above, as your chairman I intend to continue the dedication of my predecessor and the efforts of the past Council members. So far the idealistic me. Let me turn to the realistic part. I proposed the 2019-20 calendar. Because of some comments – comments are always welcome – changes have been made. Others are still to be made for later in the year. The updated version will be published on the website, and Gordon will notify you about the updates in due time. Costs and variation have been considered. The meetings still to be planned will take into account a balance in geographical locations as far as possible and practicable. May I call your attention to the changed dates in the months May and July, and to the swap in December as asked during the AGM meeting. Please consult the calendar on the website. With regard to the Billy Boules we got in touch and still await a confirmation from Calpe 41. 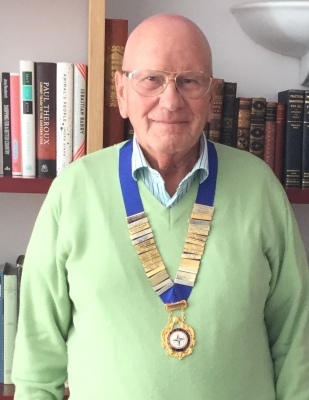 We are delighted to welcome Brian Bates from Shawbury and District (Shropshire) Round Table and 41 Club who moved to Moraira and who likes to continue his involvement in 41. Brian and Marilyn will join us at the May regular. Welcome. Regrettably Rita and I will be in Belgium during the month of May where our presence is required for an AGM (our property) and for the EU and national elections on the 26th (we can’t vote in Spain). So please excuse us.